James Harris Gallery | "Tunnel of Silence"
James Harris Gallery is pleased to present “Tunnel of Silence”, a group exhibition featuring painting, sculpture, photography, and works on paper by artists Uta Barth, Claire Cowie, Fay Jones, Aaron Morse, Richard Rezac, John Sparagana, and Akio Takamori. The title is a reference to a quote by poet Adrienne Rich who stated in her 1997 lecture Arts of the Possible, “The impulse to create begins — often terribly and fearfully — in a tunnel of silence.” With a more hopeful tone, Rich went on to say, “Silence … can be fertilizing, it can bathe the imagination, it can, as in great open spaces… be the nimbus of a way of life, a condition of vision.” The works in this show demonstrate how art is both the product of and the impetus to these productive moments, making us slow down enough to become conscious of our surroundings, and often forcing us to confront a difficult reality. Silence is what happens in moments of interstice when we hover between thought and action. This contemplative pause creates space and allows for new ideas, perspectives, and relationships to take form. This can be disorienting and uneasy, where preconceptions are challenged and change becomes necessary. But we are also reminded that nothing is static, these moments are fleeting, and we evolve. Seattle artist Fay Jones has been developing her eclectic vocabulary and surrealist style in her painting for over 40 years. 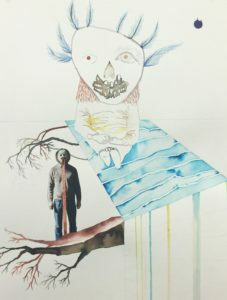 Jones’ work is infused with personal myth and fantasy, and offer signifiers to evoke imaginative associations. These narrative works pivot around tension, creating unsettling juxtapositions and setting the stage for imminent conflict to arise. 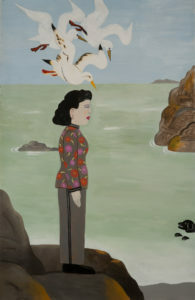 In her new works, “Sono, the Sentinel” and “Sea Dog, the Sentry”, Jones presents a central figure with the backdrop of a seascape. The peaceful tranquility of these moments is offset by an air of anxiety, where this silent pause requires an impending action that would shift the narrative in a new direction. Aaron Morse’s landscapes similarly resist the passive enjoyment of awe-inspiring landscape painting. 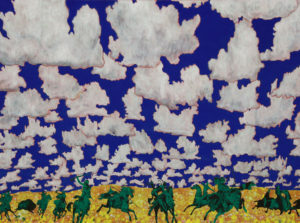 In his large-scale work “Cloud World (Horsemen)”, Morse creates a dreamscape paying homage to Maynard Dixon, the early 20th century Western Landscape painter. His painting is colorfully composed with a low horizon and an expanse of surreal tracts of cumulous sky; each cloud illuminated with an unnatural glow and orderly arranged. The artist activates this tranquil scene with horsemen on a buffalo hunt; the men, horses and beast painted in army green and paused in action as if they were toy soldiers. Morse’s “Cloud World” is a nod toward episodes from history or myth but the painting is rooted in the contemporary. Morse is driven by the vexed urge — irresistible, yet futile—to make sense of the big picture: the past, the present, how they connect, where we’re headed. Richard Rezac’s minimal abstract sculptures embody the vernacular of the ordinary as well as the sublime. His application of reductive forms mimic systems of natural order and explore repetitive rhythm and the interplay between presence and void. The intimate scale of these meticulously crafted material pieces create a contemplative space for the viewer. With broad influences such as the aesthetics of Japanese Zen gardens, American Minimalism, Baroque architecture, and geometric systems, Rezac is interested in communicative forms in physical space. 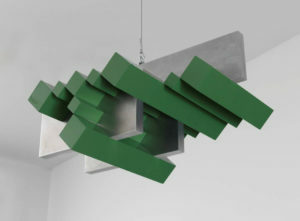 “Untitled (09-07)” hangs overhead, activating a dynamic spatial relationship that expands the viewer’s awareness of the surroundings. Since the early 1990’s, Los Angeles based artist Uta Barth has created abstracted photographs, exploring how the incidental and atmospheric can become subject matter in and of themselves. Regarded for her “empty” images that border on painterly abstraction, the artist carefully renders blurred backgrounds, cropped frames and the natural qualities of light to capture incidental and fleeting moments. 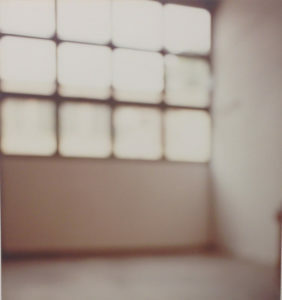 Barth renders landscapes and everyday spaces all but illegible by employing an extremely shallow depth of field. In doing so, she ruptures the age-old emphasis in photography on the referent and instead turns her audience toward its own experiences. Other works comment on the failure of verbal language, offering alternative and imaginative modes of communication to express ideas that are difficult or perhaps impossible to speak about, turning the personal into a shared experience. Akio Takamori’s freestanding sculptures investigate the interface between contemporary society and the flux of diverse global cultures that impinge on it. 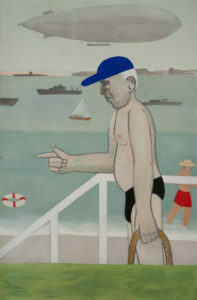 He continues to explore the realm of human experience and rational social behavior through figures of youth and old age. Monumental in scale and personality, “Yellow Karako” depicts a young sitting monk as if he is meditating. The artist posits important questions about individual history and cultural perceptions. 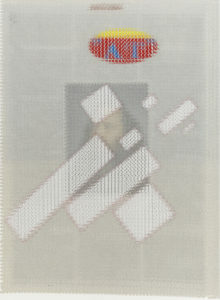 Claire Cowie sees art as a communicative language. 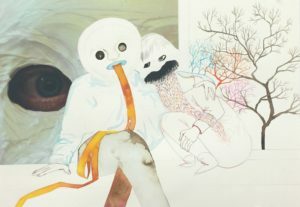 Her work usually centers on the world around her as she develops ideas and personal iconography based on family, friends and experiences. Her works on paper have always been rooted in the landscape of the mind as well as the physical landscape surrounding her. 12" x 20 1/2" x 17"
16 1/8" x 15 1/8"